Behold the Magickal Midway, with ALL its charming sideshows. Herein at last is the Magnum Organum - not the ancient instrument of Perception or the modem organ of Knowledge, but the Perennial Wisdom newly Minted and Dispensed. What's "new" about the Gnosis, MT? we hear some sigh already. With all such scattered "arcanum" now gathered for our convenience on the central new age floor of comparison-shopping, the sense distilled most strongly is that of the real redundance with which these tired volumes speak - the iteration in innumerable translations and redactions and meticulous incunabula, of "wisdom" drawn from the same few sources (whether nominally Theravada or Mahayana, the Kankala-malini-Tantra or Mahaprajna-paramitopadesa) of secrets whispered, tomb-robbed and fancifully embroidered till generational erosion degrades the imprint of the original to a garbled "Keys of Enoch" eidolon (from which all "Black Pullets" and dark grimoires may be scrawled in general information-loss of the scratchy candle-lit quill, trailing mimetic marks just near-enough the abraded godnames for suitable evocation of dross conceived in the very verbal abortions of the dim transcription itself). Forgive us, then, if we're generally jejune with respect to the "perennial wisdom" all of which seems to emit the self-same redolence from the same musty sarcophagus... and besides, so hoary an accumulation of the "old" (which might, admittedly, have got us here) is moot in any case since modernly we're launched right into the space-age upgrade, light years beyond what could be sifted from any ash of the Alexandrian library, since we're being tutored first-hand in higher-dimensional concerns by higher-dimensional beings themselves! i.e. the Space Beings, the Pleiadeans and the Arcturians and the Andromedans and the Sirians and all such transdimensional amphibians as Seth and Agartha and Ramtha! So wherefore the "perennial wisdom", MT? What makes the Southern Crown version any different from the average mass of terrestrial arcana already available in copious oversupply that we should consult "Mora Tallion" rather than Fox, "Ming Trey" rather than Cayce, "Monty Tyson" rather than Madam Blavatsky or "Mother Terasu" rather than Besant (Annie) or Muldoon (Sylvan) or Bailey (Bill...just-kidding). First of all, the smaragdine fact of Earth-history's collective arcanum evidentially converging on just a few - even overlapping - Sources so the esoteric glossolalia is gradually deciphered into a handful of familiar dialects doesn't average to a dull equivalence of the material in question. Though the point may be lost to the disinterested ear of modern hubris (happy with its "happening" sources of spaceage information-upgrade) the fact of a preponderant "unoriginality" or even average information-loss through time-sands leaked down the archeological cracks doesn't rule upon the Truth or timeless cogency of the inspiriting Source Itself; the fact of endless counterfeit and dated carbon doesn't cancel the authenticity of - or render any less Real - the Superior character belonging to certain self-shining remnants amongst the general rubble. It merely requires contemporary initiated intelligence to sift the Superior from what otherwise would remain confused with the fools-gold inferior. Some of those surviving sources are sufficiently "primary" expressions of authentic initiated Intelligence indigenous to the tutelary Type of this planetary School, as to merit continued respect and ongoing study - after all, that's Why it's called the Perennial Wisdom, because it doesn't "date", it doesn't fade to fashion or collapse with hat-in-hand to the first Voice issuing from an elevation literally above its own. It's the argument of Initiated Intelligence and its Perennial Wisdom, that what was valid "then" is valid forever. Whatever has been transmitted to the greater part of fidelity from those traditions into the present, is a viable Lifeform perhaps cryogenically "trapped" in a preservative medium (such as Tarot, or the "Shakespere" plays) which while keeping the codes intact doesn't in itself advance the healing Key, but which yields to ready thawing and a disclosure of contents in the Presence of the Living Key - i.e. the ever-awake Being of Initiated Adeptship able to disperse the Spell and, with a Kiss, bring Sleeping Beauty from aeonic slumber back to Consciousness again. Indeed, then, not only are such incorruptible Truths, Spiritual Premises and Principles preserved in whatever ad hoc container, and forwarded for the edification of any given "now"; the Living Source and Chiron-tutors of the Terrestrial dispensation having given those Teachings originally remain with us, right up to the End, perhaps a different - though sometimes, as in the present case, the self-same - Personality expression but the identical Essence nonetheless carrying forward as Office-holder in one of the three Hierarchic categories of Tikkun, or Restoration: Manu, Bodhisattva and Mahachohan. What's different then about some particular expression of the Wisdom Teaching is that, while inevitably unrecognized or underappreciated as such by un-initiate humanity it issues directly from an authentic higher-dimensional Personality-source securing one of the Offices and Rays on behalf of an indigenous tutorial function, oriented specifically with respect to the type of School founded in the Earth-spirit. Thus if anything, certain such survivalist expressions of the Wisdom Teachings require far-deeper respect and redoubled regard than is presently accorded them; and those most awakened in spirit to the special task of faithfully reconstituting their remnant hieroglyphs (as R.A. Schwaller and Isha DeLubitz or Edward Johnson, for instance) are far more deserving of study and attention than their conventional counterparts confecting the inevitable "official" truth (that buries even deeper in the desert sands whatever wisdom might accidentally be excavated). What recommends this present offering of our Magnum Organum above contemporary "expositions" of the ancient arcana (or even modern revisionisms inspired by space-being broadcast) is the self-same factor recommending those particular, preserved expressions of the Wisdom Teaching discerned above the Matrix of hodgepodge material in which they're inevitably embedded. Though you may have read much purporting to convey or interpret our wisdom, you haven't yet read the Word of the Mahachohan. It's only now, and Here with this wedge of Light slipped between and sandwiched in the general Choronzon-clamor of this world that you may do so. Wait! Wait, MT, hold on a minute! we hear from Those ever-vigilant to the hoodwinking enterprise of the mystic-mongering mountebank or sleight-of-hand charlatan (always known to accompany these road-show carnivals and Midwest midway-attractions only to litter the lineups later under positive-identification of the rubes...). What can anyone make of such a claim, when the whole category "Mahachohan" while sounding impressive-enough in the rural regions doesn't really correspond to anything...familiar? For all we know it's like claiming you're the "Rajafalafel of Rajistan"; sounds fine, and with a few epaulets and tassels sewn back on your highschool-band uniform we're sure you'd cut a convincing figure - but who'd know differently? Who was the last "Rajafalafel of Rajistan" to come through these parts? and how do we know your predecessor carried proper credentials while he was here? We arrive now at the second phase of MT's reply. Just as we've asked what ought to recommend this current material above extant offerings, we answer with the same response suited to the dilemma as to how the "Mahachohan" may be identified: read the materials contained herein. Nothing substitutes for personal discrimination, the cultivated exercise of intelligence and intuitive sensitivity. The means both of identifying the quality of the material and the presence of the Mahachohan rests as always with that inbuilt potential possessed through faculties of everyone born to the Mother. The Mahachohan, like his Manu/Bodhisattva counterparts, always sheds clues as naturally as the molting of a snake concerning the authenticity of his presence, wherever he appears; but as much as these clues are assuredly present, by that much is it the sure responsibility of each to awaken some part of the uncommon faculty within himself in order to identify that this is true. By way of example... in answer to the (largely unasked) question as to why a "christ" or "buddha" or "zoroaster" or "lao tze" isn't unanimously recognized and overwhelmingly greeted by the multitude at the time of his appearance: it is neither the business or obligation of the authentic adept, master or avataric being to manifest as other than the Manifestable to begin with. There are no "multitudes"; there's only you. The collectivity doesn't live you and die you. The multitude doesn't rule upon the great spiritual decisions of your life. Therefore such Presence is always a Test, not the doorprize in a giveaway show. One needn't be "learned" to identify such a presence; neither however is illiteracy, epilepsy, wealth, poverty or moronism a prerequisite. There is a sign, a legitimate way to know, and to be sure; and the true spiritual master is never willfully parsimonious about the bestowal of such sign. But the religious expectation, the anticipated or officially-approved sign is not the sign. Each such legitimate sign is an awakening of the authentic Person from the multitude, not through clichés of the multitude's requirements. Nor does this make such sign merely "self determined" or subjective or the private ego-identification whereby "my truth isn't the same as your truth, but I honor your beingness blah blah blah..."
The sign always has the power of a real event (which as we know, when we're not distractedly infatuated with or hypnotically enthralled by the dream-drone "You Create Your Own Reality", instantly disperses the subjective integrity of our mind-held preferences and preoccupations). Yet its power as a real event is peculiarly dependent on the personality's power to admit it into his world for what it is, just as the Aztecs couldn't at first see the Spanish ships though they were just offshore. Though the term "humility" is the least fashionable of any human term, nonetheless the first-line gift for the kind of insight able to deliver such accurate Recognition depends - more than anyone would like to concede - upon that Grace of the truly humble who without self-serving show may make a deep self-admission down past jealousy or rage, envy or resentment at the perceived power of the Master to Show as none other can Show, and Tell as none-other can Tell. For, after all, in this mudhut schoolhouse of Earthburg, Show-and-Tell is the deepest game that can be played, for which the "Confessional" of the catholic cloister is the nearest religiously-mangled approximation. This then is the significance of "confession", and the true sense of that "humility" about which the reader doubtless thought he'd never again have to hear (having struck out on the road of spiritual independence from childhood churchliness and subsequently found so contrastive a counsel in "adult" spiritual fare as the Matrix Home Companion he's holding now). This is the sought-for face of the "humble" (as opposed to the thousand-and-one Eddie-Haskell counterfeits dramatized daily in the theatrical sandlot of this place). Confession to some Cloth, so peculiar a ritual abreaction when its origin and real function are long lost, only acts as socially-cementing substitute for that real inner confession the ruling priority of which isn't to be stated but to be inwardly honored and lived; such confession can only proceed from real humility, since only the authentically humble can inwardly bow in ego-solvent recognition ofwhat1's precedent to (i.e. "in advance o f , "beyond" or "above") itself. This alone "demonstrates" an ample Grace: that which bows to the side in sure intuitive knowledge and subjective certainty, ceding Place-of-Honor in the soul's preferred seating-arrangements to what humility alone may recognize has come as the Superior Part to Instruct the 3rd stage Confession, so as to uplift and Relieve it at last. Otherwise, what's there as the avatar of false humility is the standard ego-ploy of "something for nothing" - feigning confession while secretly hallucinating how it strokes an "ego" similar to itself for the benefits it may charm-loose and lasso to private aggrandizement. What's there, is resentment at something the soul already confesses despite conscious reluctance (as if the "soul" were suddenly given to cuckolding the phallic sovereignty of "I") so that, caught on the horns of this inward betrayal the ego resents and objects all the more, and in the guise of one receiving "instruction" progressively demands that more-and-more be given for less-and-less attention in just the proportions, quantities and containers specified. The above depicts fairly gracefully the jaundiced attitude of the regular seeker, seeking really to be the Avatar and sole sovereign recipient of the Universe's adoring Attention. Ingress to the characteristic Confessional obliged upon adepts, masters and avatars of this domain on the other hand, may be located in the kind of humility alluded to by Meher Baba when making his admission-to-the-world as to his authentic avatarship. This sort of humbleness is not understandable at all to those for whom "confession" of avatarship automatically, inevitably and necessarily signals ego-aggrandizement - this, of course, owing to the fact that in the projective case of themselves such confession could only be ego-aggrandizement. But for the authentic spiritual master any such pronouncement comes as a real admission, a confession in truth owing precisely to the most intimate understanding of how Impossible such a Position (state or condition) actually is, not only with respect to the current level of mankind's comprehension or according to the real magnitude of the "difficulty" involved, but simply as a measure of the Chasm between finite knowing and Infinite apprehension, suspended in the Samadhi of Confession but materially present in and along-with every gesture the avatar otherwise makes, being an inexpugnable aspect of the Whole right with everything else. It's for this reason and no other an adept or avatar (of one-or-another theosophical Office) "doesn't mind" making the confession of his or her uncommon Presence in the world - understanding the above, there is no question of "ego" lingering in any such confession at all. Yet this is something which must be Seen, inwardly determined by the potential spiritual aspirant to the degree the Great inner Organ of Knowing may be consulted at its current level of free Admission. This may be an unwelcome word to many readers (you might be surprised, indeed, as to which readers) - but it's simply so. The Universe won't change itself because someone objects to the requirements. Alright, MT, we hear the reader readily consent to his own impeccable humility, there are things the seeker must do, and developments he must endure; that's fair enough. But, though there's no convenient sign or standardized template in the sense of some automatic comparator with which to evaluate the nominee to Teacherhood (and thus avoid any personal work) surely it isn't too demanding to ask at least for bearings in this bewildering sea? Surely it's not beyond the bounds of propriety at least to ask the MT Who the last manifestation of the Mahachohan might have been? (since, meanin' no disrespect yer honer but, well, this business of the "Mahachohan" just doesn't choke folks up right away with the kind of instant recognition you might get when speaking of say, buddhahood or christhood, y'know. "Mahachohan" just doesn't automatically drum up a lot of vivid images or strong associations, unless it's that of a triple-whirl dairyqueen...y'mind just givin' us country-folks a "fer-instance"? All right. The last manifestation of the Mahachohan appeared in Elizabethan times, as... Francis Bacon. "Who?" half the readership asks automatically, while the other half, in Oliver Hardy counterpart, lifts one brow of bright recognition while a shadow of perplexity crosses the countenance at the same time. Wait a second, this second half says, how can the Lord Chancellor of England qualify for some spiritual Office when he's most noted, aside from bribery charges, as co-author of the scientific ethos along with Descartes? Though many are willing to concede that, as the Britannica proclaims, he was the greatest mind of the Renaissance, that's hardly the same as being a great spiritual Light - indeed just the opposite, as half the new age architects are willing to attest - e.g. Theodore Rojack in particular takes exception to Bacon as being, perhaps, the most "pernicious" influence amongst all the acknowledged renaissance luminaries. How does one reconcile the apparent concerted materialism and rational skepticism of Francis Bacon with the idea he's Mahachohan and thus a manifestation of one of the three spiritual Offices of theosophy? Here's how, MT rejoins with the case for the defense: what's conventionally "known" about Bacon is hardly all there is to know about him. However, what's not academically sanctified isn't banished thereby to inaccessible regions; a tradition persists in the Mystery School arcanum to the effect that Bacon, like several other court luminaries of the time such as John Dee, led (at least) a double life. Whereas Dee was not only Elizabeth's court astrologer and conduit of the Enochian Tablets (along with Edward Kelly) but a spy for the crown in foreign realms and the original 007, Bacon was the pivotal hierophant single-handedly responsible for consolidating the fragments of initiatory societies throughout Europe and renewing the Mystery Tradition altogether for the coming age; he was, as Manley Palmer Hall reiterates in his Secret Teachings Of All Ages, the original Rosicrucian or Christian Rozencranz himself, through whom the symbolisms and initiatory practices of the secret societies streamed forward refreshed in the forms of spiritual Masonry, various Rose-cross Orders and more generally the Qabalisms that appeared in specialty through distinguished outcroppings of Flammel, Maier, Fludd, Ashmole etc. Therefore all such societies to the present day regardless the alleged or real corruptions they've undergone or the syncretisms by which they're subsequently characterized, owe their being in substantial part to the private studies, the hidden practices and secret lucubrations of the Lord Chancellor. How does all this square with the apparently antithetical character of his Novum Organum, Great Instauration etc.? wherein the crown's chief lawyer set forth all the essential precepts for what has become by hindsight the "self-alienating" modes of cognitive objectification and reductive analysis etc.? In answer, we must assume an uncommon or esoteric overview. We must understand the renaissance for what it was, and what it meant in larger spiritual terms as an expression of a particular cross-roads juncture in Earth-conscious development. We may say that, by Overview, it was the determined "commission" of the Spiritual Hierarchy ("Great White Brotherhood" etc.) which oversees mankind's spiritual progress to greater or lesser effect, to foment the European Renaissance - in conjunction with a general counterpart revival of Qabalism spearheaded by Moses Cordovera and Isaac Luria in Safed, Galilee - as an acute counterbalance of personal investigation/insight unfettered by authoritarian religious sanction in reaction to the receding Middle Ages. At the same time, the Brotherhood was not uncognizant of the kinds of purely "materialist" focus and analytic concentration such emphasis would engender; as with every great Spiritual Move, the inevitable "negative" side-effects were calculated into the overall account as a kind of advised "risk" presumably subsumed to the larger Aim of quickening the corruptive and disintegrating influences coded in any case into the last cyclic Stage of the Kali Yuga (the final and most negative of the four great spiritual cycles) so as to hasten the general conscious-alchemical process of Solve. The stage of Solve, (decay, corruption, entering-into-solution) is, in alchemy, the prerequisite condition for recombining the dissociated elements into new and higher syntheses; as with all things of which consciousness is the standard, the forms into which patterns become crystallized giving the contextual limit of their elemental interactions must undergo a transmutative process much like "death" - the known/comfortable identity-types must dissolve, having become progressively dysfunctional owing to their rigidity in a changing context, in order for their constituents to be freed thus contributing to more supple integrations and versatile/unitive alignments with the ample totality. The thrust of the Brotherhood was therefore two-fold; on the one hand it would strike a blow to free consciousness-in-general from corrupt misapplication of the deductive mode and the a priori; on the other it would assay to incorporate the resultant imbalances tilted to the opposite (inductive/a posteriori) side, so as to accelerate the coming disintegrative force of the final phase of the Kali Yuga (through which we're now collectively passing); the rationale for this is the same Biblically memorialized in the saying that, unless those "last days" were shortened, none would survive their corruptive power (i.e. the longer the actual time-span allotted negative influence or the slower, more leisurely its stretched-out distribution of effect over the given allotment of time, the more thoroughly would consciousness be subjected to its power and thus the more fatally saturated in its quality, so that nothing might recover from so complete an exposure). Therefore the Brotherhood sent its Mahachohan to produce this two-fold effect in the world, at the critical juncture of the Renaissance. What we "see" of Bacon officially, is not as a consequence all there is to see. If we could understand that what we see of him in Novum Organum is but a facet of bis overall work and being (and that, not necessarily appreciated or understood for what it is regardless the admitted scope of its influence) and, that there are other equally-as-powerful and fateful influences flowing directly from his presence not conventionally ascribed to him or associated with him, we might come more easily to see how Bacon fulfills the truly spiritual dimension indispensable to any characterization of the "Mahachohan". What if this allegedly "objective", detached proto-scientific type were juxtaposed against the universally acknowledged heart and monumental humanity of a "William Shakespeare"? 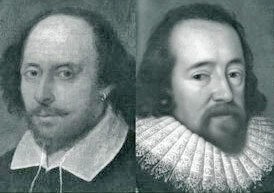 and what if in this juxtaposition we suddenly see, as by a miracle, the "two" countenances blend unmistakably into one (just as the famous Droushout portrait of "Shakespeare" dissolves unmistakably into the template of the Baconian bust when superimposed - see graphic evidence in Hall's Secret Teachings etc.). What? Come now, MT, you're not falling back on that hoary old argument of the "Baconians", long disproved and passed-on by scholars everywhere? Why yes, as a matter of fact MT's doing just that; indeed he's calling succinctly for a republication of all pertinent (and largely out-of-print) volumes pertaining to the Baconian/Stratfordian logomachy, just as folks have currently been calling for a reopening or public disclosure of the Congressional archives in the case of the Kennedy assassination. Even more emphatically than the Warren Commission failed to "prove" its lone-gunman thesis, so the Stratfordians, it will be found in any fair review of the respective documents, never came close to disproving the Baconian thesis - on the other hand, the Baconians and in particular through the prolific work of Edward Johnson have definitively proven already beyond the shadow of any reasonable or unreasonable doubt, not only that the actor "Shakespere" could never have written the plays but that Bacon necessarily had to, and moreover left ample encrypted evidence to prove it! Think not? Though this isn't the place to go into an extensive examination of the subject, we may certainly give brief example - keeping in mind these examples are hardly exhaustive nor necessarily the best to be found but merely typical of a fulminating Mega Ton of unimpeachable evidence (this subject is treated much more extensively in The Mother Book, however, wherein another and even greater Element of corroborative evidence is introduced which in effect brings the whole Law Book to bear on deciding the case for the defense). Here we may suffice with one or two examples from Johnson's classic casebook, and a fragment of an example from MT given larger exposition in The Mother Book. "Begun to tell me what I am, but stopt/And left me to a bootelesse Inquisition,/Concluding, stay: not yet." Not only do the first letters of the first and second lines wed to the last three letters of the third render BACon, but such a cipher is typical of known ciphers in Bacon's acknowledged works. Again, Bacon's initiatic number by simple English "qabala" (explained in extenso in The Mother Book) was 33 (thus the 33rd degree of Freemasonry). On one folio page of King Henry the Fourth Part One, the name "Francis" or "Fran" appears exactly 33 times. "to attain this end, obvious awkward sentences were required, as: ‘Anon, Francis? No, Francis, but tomorrow Francis: or Francis, on Thursday: or indeed Francis when thou wilt But Francis.'" From the memory files of MT, we have the interesting example of "Shakespeare's" most familiar appellation, of syllables so warmly lugubrious and reassuring to Stratfordians everywhere: "The Bard of Avon". This endearing "title" was bestowed upon the false fronting actor/joint owner of Stratford on Avon by his ostensible "good friend", Ben Jonson. Now it's well known that Jonson was a best friend of Francis Bacon. Extensive documentation testifies to this fact in the form of diaries and notes, whereas Jonson's "great friendship" with Shakespear is evidentially confined to a few brief Jonsonian references to the "bard" not all of which are flattering in the least and some of which are only interpretable as outright ridicule (a fact the Stratfordians duly ignore; just as they ignore the fact that, though Jonson was ostensibly a mutual friend of both Bacon and the actor Shakespere there is not one mention in all of Bacon's voluminous writings re "Shakespere", or "Shakespear", or "Shakespeare" etc. For the "two" greatest literary lights of the age sharing a mutual friend between them not to find even the semblance of an association making its way to a single surviving page has to be one of the historical oddities of all time - until you realize that, given Bacon's undoubted knowledge of Hebrew Qabalism by internal evidence of his own writings, we find "Bard of Avon" dissolves by Baconian magick into Bard of (o=6,f=6:6+6=12:1+2=3,3=Gimel, in English equivalency a "G" or C) Avon: Bα C on. The remaining internal letters (r d a v) also have deep meaning discussed more fully in The Mother Book). This then gives the readership a brief depiction of a former manifestation of the Mahachohan (see excerpt from introduction to The Mother Book, this volume, for more on past historical expressions of the self same single Personality of the Mahachohan; and see The Mother Book itself for an extensive examination of all these historical personalities and their hidden interrelationships as well as an exposition of a known spiritual text which proves their collective Identity through a Magickal manipulation of Time Itself). Therefore we offer this Magnum Organum as present Teaching of the Mahachohan. Understanding of what's given here in any sort of depth will certainly require study, review, an abandonment of speedreading, a relinquishment of insistence upon what's definitionally "easy" for oneself. In other words, to extract the precious essence of a real Teaching, the veritable Pearl of Great Price, requires Work, just as one must pry the lid of an oyster if one would extract its nacreous core. But wait again, MT! we hear an uncomfortable commotion from the back of the room, don't our dear friends the "Marciniak Pleiadeans" tell us specifically that if something requires work it's not worth it, and we shouldn't have to apply ourselves to anything we find "hard"? "If something is not being done effortlessly, then forget it. If it looks like it is too much work, something is telling you it is not the way." If folks can actually accept these homilies from the ventriloquist transmissions of perfectly unapparent entities, then such folks are welcome to them. It's a good thing however that the Marciniak Pleiadeans never counselled Jesus or Buddha, never whispered their wisdom into Einstein's or Edison's ear or told Tesla these scintillating truths - let alone coached Jim Thorpe, or trained Jake LaMotta! "We recommend that you do a little questioning of anyone who overdefines and tells you absolutes". Well, we recommend you question any ostensibly celestial or "higher dimensional" source which has no account of "absolute" in its highflying corpus at all, for which in fact "absolute" is such anathema; for these are those same who absolutize relativism inferentially in the same manner as Bashar, and to the same self contradictory effect (see Bashar book review, this volume). These are those for whom "over definition" apparently has some meaning, whereas "absolute" apparently has none. "You have come here to hold new frequencies being beamed to you from space... As you begin to know that this is your purpose, you will begin to design your purpose consciously... This is an absolute." Page 114, op. cit. No. Yet every significant Teaching of a truly higher Order or density degree above 3rd pivots its philosophy around a deep and necessary understanding - even practical apprehension - of Absolute. "We like to pride ourselves on being storytellers. There is a certain credibility and a certain sensationalism in the way we present data. However, a story that we tell you at one point is certainly not the only story; it is not the end, and it is never the only truth. It is only one fragmentation, one small portion of the bigger picture. "No matter what story we tell you today, we guarantee that a year from now we will tell you a different story, because a year from now you will be able to comprehend things in a grander fashion." universally applicable under any situation, a permanent attribute of the soul's essential armamentarium, whereas tales of our "extra planetary" origin etc. are self evidently contingent, depend on one's personal ingenuous subscription or unconfirmed belief taking the "source" of such narrative at its word as innately "honest", and without ulterior design. Clearly defined first principles introducing the soul to the ontological depths of itself can be applied; tales as to our ostensible "celestial parentage" can't be applied, but merely believed, leading nonetheless to actions on the basis of such belief which haven't benefit of reliance on anything more substantial than the initial motivating hearsay. Yet, this seems to be exactly how the "Pleiadeans" want it. However, owing to their "confession" as shapeshifting storytellers we shouldn't expect any more consistency or carry through logic on their part; thus when they chide us, on the one hand (with an "eye" this way? or are such speculations just more self importance with no basis in fact?) to "Look at the New Age. Do you see how the New Age is separated? "You must become much more discerning about what and who is coming from the skies, because you are going to be duped and tricked and you're not going to understand it." Any reasonable soul would of course ask how we're supposed to be so discerning, and at the same time honor some ideal of non separate "camaraderie" in the New Age when those with whom the Pleiadeans are counseling us to have such camaraderie are often channelers and spokespersons for just those tricky sources they'd warn us against! Apparently the Pleiadeans (or at least the Marciniak mannequin through which they speak) are unable to resolve such contradictions, since, as token toward that comradeship the jacket of Bringers quotes glowing words in re view from Darryl Anka "channel for ‘Bashar'" while "Bashar", as it should be clear to all - at least after reading the Bashar Book Review this volume - is precisely the type of "tricky being" who tells you "you create your own reality" so as to lure you into acceptance of space-alien abduction! Ostensibly the Pleiadeans wouldn't want the readership to get the impression "Bashar" is "just okay" with them though "he" appears by endorsement on their dust jacket... would they? Or is it just that they share an endearing trait in commonality with 3rd stage humankind, and will wantonly quote anyone or anything at all having a kind word for them despite what they otherwise know about said source? In any case, the reader should understand right here, before Entering the Sanctum Sanctorum at all, that by studying very precisely defined first principles he will come to activate and unfold precisely those universal truths to which they correspond; whereas by heeding self admitted stories spun by invisible Sky narration he can only lurch blindly along by the nosering wherever the "stories" lead. And let's look more closely at the nature of those stories: while they may seem to be more "entertaining" than the dry definitions of dehydrated spiritual concepts, at least with a little "water" (your transformed hormonal chemistries) such definitions may be re hydrated and expand to Life within your own being - whereas with the "entertainment" you can only continue switching dials in channel surfing comparison from one to another source purporting to "explain" how you got here, or to account for the circumstances in which you currently exist. Thus you may accept hearsay of the "Pleiadeans" that the invisible barrier of the planetary energy net is a masking screen originally thrown ‘round the planet to "keep you here", by the negative reptilian types; when this business of the enveloping energy grid sounds vaguely familiar and you turn to a source such as Rα wherein you recall having heard something parallel, you're faced with the conundrum of "choosing" between diametrically opposed explanations - for the Rα material insists this same energy screen was installed by the Positive Hierarchy to impartially preserve the Earth-sphere from undue influence impinging from without. Now, you can "take a stance" and decide on the basis of nothing-much just which source is "telling the truth" (and thus, which source is inferentially the "good guy"). But this has nothing whatever to do with spiritual development. It's cowboys-and-Indians, or choosing sides in a televised football game. the disparity of "stories" from separate sources pointing to the same general thing or phenomenon, isn't necessarily an effect of relative veracity. Both stories may be "true" in their contexts! For the context is, that each such storytelling source approaches from Elsewhere at an oblique angle; this "angle" isn't just spatially oblique - it's composed rather of probability components. Each source approaches from a slightly variable - or greatly variable - probability-current. From the perspective of any given outside source, "we" may have "gotten here" (and presently inhabit circumstances) according to the specific probability field by which that source is remotely connected to us. Thus while each may "perceive" the same basic condition or "fact" as the other (e.g. the enveloping Earth energy-net) they may perceive its origin, purpose and significance quite differently depending on the luminous probability-stream down which they respectively sight. Edgar Cayce saw the "destruction of Atlantis" as self-induced; the Andromedans as reported in Col. Stevens' book on same, attribute the destruction of Atlantis to a hostile ray from the planet Marduk. Both perceive the bare "event", the "destruction of Atlantis". Yet each perceives and thus interprets from a variant spiritual-cosmic "perspective". That perspective has to do with the varying density-degree of the given sources, the relative position both in time-space and space-time mediated by each etc. This effect can be understood on the basis of first principles, in this way. Just as there are emphatic astrological configurations (conjunctions, T-squares, trines) set by the timed/coded cycles and internal coordinates of things to occur so there's no real chance they won't occur, yet these significant coordinate "nodes" aren't strictly determined in the same way beforehand re specifics of the events they foreshadow. The events themselves must come to pass according to the type and quality of configuration; but the determinative content surrounding, feeding into and concretely constituting those events are variable just as the exact meaning of Jupiter-square-Neptune may discharge in several probable ways and only arises as a specific complex of factors in the relative context " I " experience. In the same way the "sinking of Atlantis" or the "Earth energy-screen" may be considered a "necessary scheduled event"; but a number of probable outriders issue from the raw potential of any such event Those probabilities will "materialize" in their own separate contexts according to the coordinative streams that connect the percipient to the event. Thus in one context the spiritual learning requirement signified by the scheduled presence of an "Earth energy-screen" may come about as the apparent result of spiritual determinations issuing from a positive "Confederacy"; in another context, according to the luminous self-linkups of probability networks the requirement might be fulfilled through nefarious designs of some Negative machination. In either case the "requirement" is fulfilled, yet each probable event carries its own stress, implications, net of consequences and probable-projections in turn. Thus the "acceptance" of any given "story" of any given source as of primary importance regarding "your" origins, the facts and meanings of "your" present condition etc. isn‘t innocuous. Acceptance of any such story (and a concomitant unacquaintance with first principles) inexorably links one to the probability-cords characterizing the specific circumstances of the beguiling storyteller. Though you may not have begun on that probability-curve, you wind up shunted onto it! You are, effectually, the "guest" of those who invited you to accept their version - a "guest" who's committed for the duration (without in any way having realized beforehand the significance of accepting so apparently-harmless an invitation). And from what probability-perspective do the "Pleiadeans" weave their enrapturing stories for Earth-edification? Why, those who counsel us as to the negatively-designed presence of the Earth energy-net come from a self-admitted future probability where the evil Reptilians have taken over the planet entirely, and the whole rest of the known universe on top of it! This is the "reality" to which they'd have you assuredly linked so as to throw your energy in as aggregate support, at the critical juncture of 4th density Earth transition echoing-forward innumerable potent probability streams. Yet as an incarnational being you're connected to an Earth-history which is unique to your perspective. You're not obliged to "choose histories", or accept stories, indeed you should not, for all that is a distraction to spiritual development. If indeed you "create your own reality", ask the Pleiadeans how such philosophy seems to have landed them in the negative mess they describe which is manifestly not to their liking, and for the repair of which they're specifically here at our doorstep at this Time? Yet "enough of Because". BAShR (i.e. "Bashar") in Hebrew, my dear thelemites, means "because". In the time-honored tradition (especially at those junctures of spiritual renewal and the founding of New Dispensations) we employ Prophetic Criticism of the prevailing World-view as inspirational point-of-departure whereby to introduce the Major Positive Key of the Spiritual Philosophy itself. Since we're at a uniquely critical juncture of historical "time" where there's really no prevailing Worldview or unified philosophical outlook other than "me-ism", we bring Prophetic Criticism to bear upon an Incoming Philosophy which presently is in the gesture of attempting to install itself as the new regnant Woridview, i.e. "You Create Your Own Reality". We insist this is not the right philosophy, and isn't really a "teaching" at all but is rather the tendentious ploy of a certain heterogenous aggregate of extradimensional sources from the same general level and "family background" yet prosecuting the identical Sky-slogan each for its own separate-and-unequal purposes. Thus we open our Magnum Organum - after a Word On The Mother Book - with practical instruction in Charger Breathing so as to fortify the soul and strengthen the body-mind in the most immediate, tangible and practical way, in anticipation of that necessary Opening of the Inner Eye and Intuitive faculty partially induced by the dialectic essays themselves but in any case ultimately required so as to click in optimum manner with the Superior Cogency of the Mother's Spiritual Dispensation. From there we introduce you to several reviews, movie-and-book, previously published in Thunderbird and supplying an entertaining means not only of approaching the eventual Instauration ahead, but of extracting deeper values and richer meanings from the "light stuff' usually passed-over. We then launch into the pastoral opening of our Argument, the beginning of our prophetic Criticism in "Why You Don't Create Your Own Reality" printed originally in the T-Bird circa 1989. This leads toward the Heart of our Practical Demonstration by way of "What Is The Mother Current? ", i.e. the two-part essay "Motto-in-the-Lotto/The Big Spin" wherein the first great Miracle of the Mother and Mahachohan is introduced (for the second and Greater miracle of the Mother/Mahachohan, see The Mother Book). The following section, Mother-current Transmissions, advances the demonstration by way of revealing the demonstrable Way of Initiation, and of the initiate. In Mordrend Technologies we address the verboten, not only in terms of the secret science/technology which isn't supposed to exist (but does), but in terms least familiar to the public perennially treated to window-dressing and never let into the Store, where the real business of karmic bookkeeping for the planet takes place; herein that public will find Mother and Father at their designated labor, much to the general surprise, so that many are bound to bridle at first the way children do when initially beholding their parents at work in the actual job-context, thus waking up to the behind-scenes truth re the way in which those children had been invisibly and unknowingly supported all along. Next we give the readership a preview examination of our extended discussion regarding the theosophical Offices and Rays, with special emphasis on the Mother's Ray of Intelligent Activity, in our Mother Book Introduction excerpt. After that we bash on ahead into the "heart-of-darkness" or dialectic rendezvous with the space-being Bashar, opening out immediately thereafter into the Principal Essay, The Great Instauration Finis (or Thank God It's Friday, we're in Safe during the Sabbath). You'll find numbers of other interesting things along the way, all of which advance in some specific manner the Courtroom Case for humanity against those incoming Accusers said humanity seems so-far not even able to identify. Fortunately, mankind has for its Attorney the greatest Lawyer the world has ever known. P.S. We have retained the various MT noms-de-plume under which the T-Bird articles were originally written. Each such name (Mora Tallion, Monty Tyson, Mick Trumpet etc.) is "Michael Topper" under yet another occult butterfly costume, the moniker-markings of which may provide moments of diversion and amusement to the readership in their own right since each enshrines a "formula" pertinent either to the particular article or the class of article. Thus "Mora Tallion", when deciphered using a substantial-enough English dictionary, resolves itself into two basic terms: "crown" and "balance/revenge". As the MT persona presenting the Charger Breathing articles, the name suggests the bringing of Balance back to the Crown (crown-chakra, Sahasrara) under the general Aeonic formula of Horus (in Egyptian myth, Lord of the Double Horizon [balance] said to restore Order in revenging Osiris' death against Set). Thus all such butterfly costumes of "Michael Topper" serve to reveal some aspect of the Dispensation brought forward by Southern Crown/AAA and the Mother-current, while at the same time serving to divert attention from the fact that "Michael Topper" is the dream of the Butterfly whose costumes have been borrowed. The various references to T-Bird issues etc., wherein other and related articles appear, weren't edited out owing to time; but check whether some of those references aren't in this present Matrix collection also. The oft-referred-to essays "Channeling etc." and "What is ‘Christ Consciousness'?" as well as "Precis on the Good, the Bad and What Curls Up Under a Rock" all appear, virgo intacto, in Matrix III. Oh yes; and in all this excitement MT forgot to mention The Southern Crown YAZI-DICTIONARY (wherein you'll even find "Southern Crown" defined!) preceding the Charger Breathing section, almost immediately following this Introduction which - appropriately enough - now comes to an End.